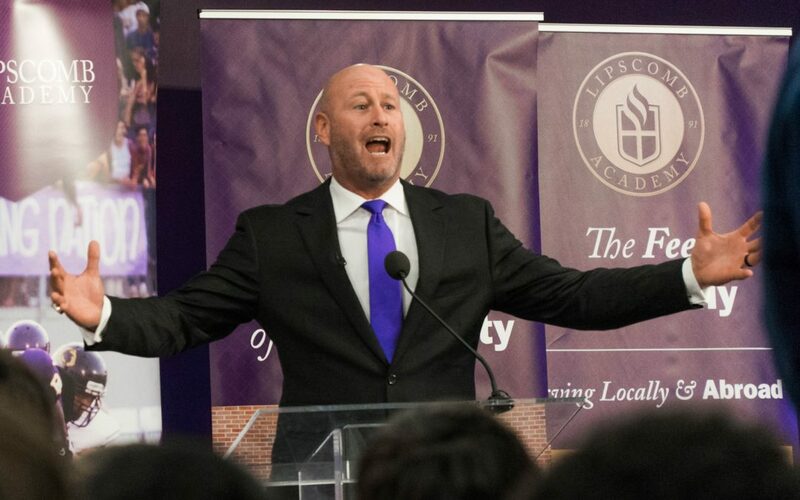 When Trent Dilfer toured Lipscomb’s campus, he knew he had found a special place. What the former NFL quarterback didn’t realize was that Lipscomb University had an affiliated high school on its campus that just happened to have a need for a new head football coach. It turned out to be the perfect marriage. The official announcement of Dilfer’s hiring came during a jam-packed press conference at the McCadams Athletic Center Friday afternoon. But the news was leaked earlier in the day and caused the school to buzz with excitement, according to the players. Lipscomb finished the 2018 season with a dismal 2-9 record. Coach Scott Tillman resigned in November, and the administration began a nationwide search for his replacement. The opening generated interest from more than 80 candidates, according to Lipscomb Academy headmaster Greg Glenn. But Dilfer didn’t see much “nobility” in the TV world and knew he wanted to get into coaching. He served as an instructor at Elite 11 football camps, where he mentored quarterbacks like Kyler Murray, Jared Goff, Tua Tagovailoa, DeShaun Watson and Jameis Winston. The Lipscomb Academy football team is in rebuilding mode after going 3-19 over the last two seasons, but that did nothing to curb Dilfer’s enthusiasm for the job. Dilfer said he will look far and wide to find assistant coaches to help him run the program. But first, he wanted to make one thing clear: he believes the current players have potential. “Nobody outside of God sees more potential in these young men than me,” he said. “That’s how I’m wired. We’re in a world right now that wants to put limits on people.